GPCC announced the 2017 ATHENA Award recipients during its 30th Anniversary ATHENA Awards Luncheon Oct. 25. Click the photo to see more photos from the 2017 ATHENA Awards! 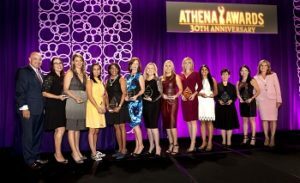 The Greater Phoenix Chamber of Commerce (GPCC) announced the 2017 ATHENA Public Sector, Private Sector and Young Professional Award recipients during its 30th Anniversary ATHENA Awards Luncheon Oct. 25 at the Westin Kierland Resort & Spa. Mi-Ai Parrish, president of Republic Media, was awarded the 2017 ATHENA Businesswoman of the Year Award in the private sector. Michelle Just, president & CEO of Beatitudes Campus, earned the 2017 ATHENA Businesswoman of the Year Award in the public sector. Drena Kusari Berisha, General Manager, Southwest Region, of Lyft, took home the 2017 ATHENA Young Professional Award. The ATHENA Awards, named after the Greek goddess of courage and wisdom, is a program of ATHENA International, a non-profit organization dedicated to creating leadership opportunities for women. The ATHENA Award, an honor awarded internationally, recognizes exemplary achievement and challenges its recipients with a continued sense of responsibility, support and leadership. The ATHENA Award honors women who have consistently invested in themselves, their profession, their community, and especially other women. They have achieved the pinnacle of success within their industry, have mentored women throughout their career, and have dedicated themselves to the community through various activities and charities.